Harry Cook was born in the UK but moved to Australia when he was 10. He began acting in his early teens and soon scored a breakthrough role opposite Academy Award winner Geena Davis at age 17. He has since starred in various TV shows, films and theatre productions both nationally and internationally.In 2013, at age 22 and after years of struggling with his sexuality, Harry came out publicly to his fans on YouTube. At the time, Harry feared the impact his coming out would have on his career, but knew he had to be true to himself. The video went viral overnight and Harry became front page news in Australia, the UK and the USA. 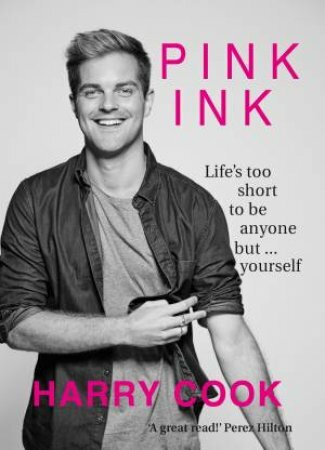 Since coming out, Harry has been at the forefront of LGBTQI Activism both nationally and internationally.Pink Ink is a memoir of Harry's life, his career in show business, his intense battle with addiction and ultimately his resilience and push to find acceptance within himself.The book spans across Harry's life from moving to Australia to landing his first major film role, travelling to the Maldives to shoot a surf thriller movie (without being able to surf), attending the Tribeca Film Festival in New York City for his first world movie premiere; and also the darker days of coming out, his severe battle with alcoholism and addiction and his time in a rehab facility at age 19.Pink Ink also covers Harry finding love just a month after getting out of rehab, rebuilding his career, getting married, and fighting for equality back home in Australia. Harry's story is both touching and hilarious, warm and gritty. Pink Ink is a story that is is an inspiringly raw and honest read for anyone who is struggling with the angst of adolescence, facing adversity or wants to know what life is really like behind the glitz and glamour of Hollywood and show-business.